A reverse cycle air conditioner is an air conditioner in which the refrigeration cycle can be reversed, producing heating instead of cooling in the indoor environment. They are also commonly referred to as a “heat pump” which is a popular name for them in New Zealand. Occasionally they are more simply referred to as a wall split, ducted split, packaged air con, roof top packaged, vertical packaged ducted air etc. 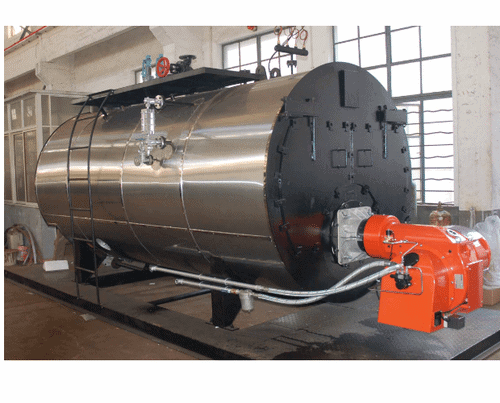 The basic design principle includes major components like the evaporator, also known as the “Indoor coil”, a Condenser, also known as the “Outdoor coil.” Each coil has motors and fans to move the air known as condenser and evaporator fans. The motors can be variable or fixed speed and these days come in AC and DC variants. Fans can be belt driven or direct drive, with belt driven fans requiring the most maintenance. A compressor pumps refrigerant around the system in one direction for cooling. A reversing valve changes the direction of gas flow in heating mode and voila! You have hot air inside for winter. 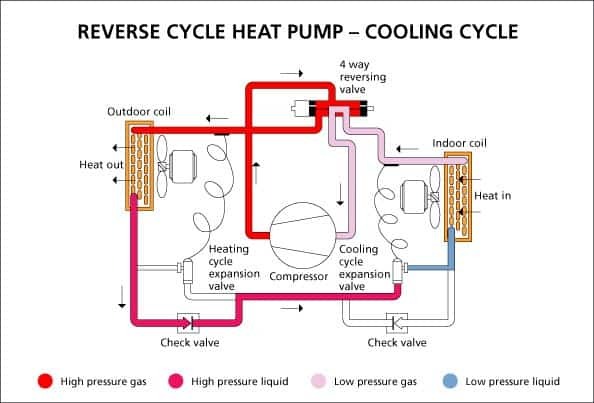 Not all air conditioners that heat and cool are called reverse cycle, like this chiller for example. Some systems are “cooling only” and use electric heater elements or large boilers to reheat the air in different “zones” via “VAV Boxes” (Variable air volume). These systems usually are found in large multi storey buildings or establishments and if there is a chiller on site. Vav boxes control the volume of conditioned air and sometimes reheat it when necessary. They are usually hidden in the ceiling space, so you might not even know they are there. But don’t worry, we will find them! Masters Hardware realised that shopper comfort was integral to a good shopping experience. They knew that the longer a person stays in store, the more they spend! That is why we were contracted to install their Roof top packaged air conditioners across their Perth stores as shown here below. 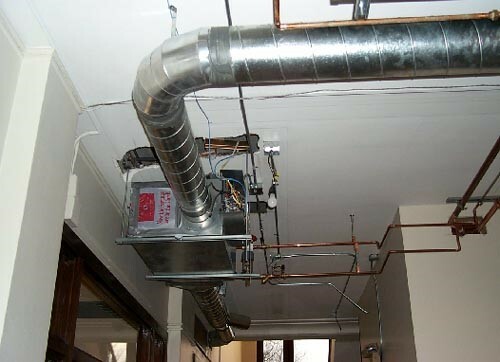 The roof top packaged system, is as the name suggests, a complete packaged unit that simply gets connected to ductwork that distributes the air into the building. 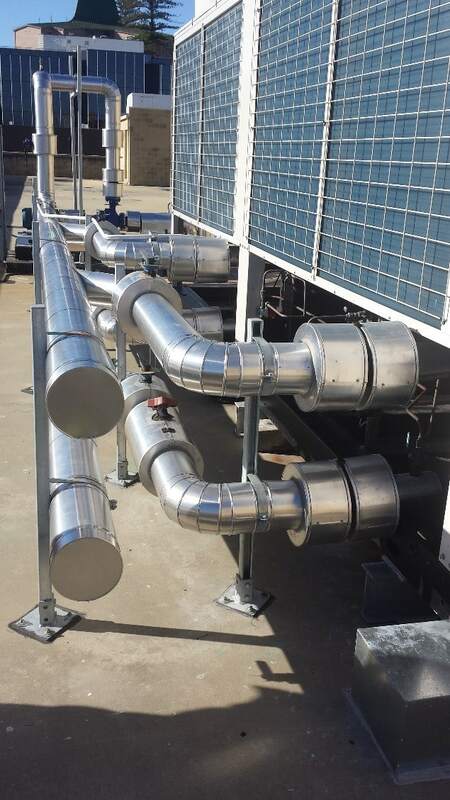 Whilst the sheetmetal ductwork costs more than split system piping, one main benefit is that all service can be done on the roof of the building. This means that there is no inconvenience to shoppers or customers during and service or maintenance. 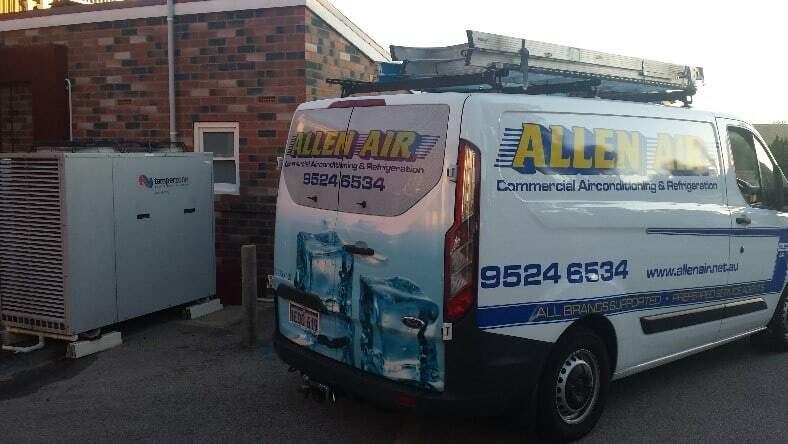 Whatever the brand or type of air conditioner, Allen Air & Refrigeration can service them all and have spare parts accounts with all suppliers. So, if you have a reverse cycle air conditioner you can have confidence we can service, diagnose, maintain and repair your system. Call us today for a quote!